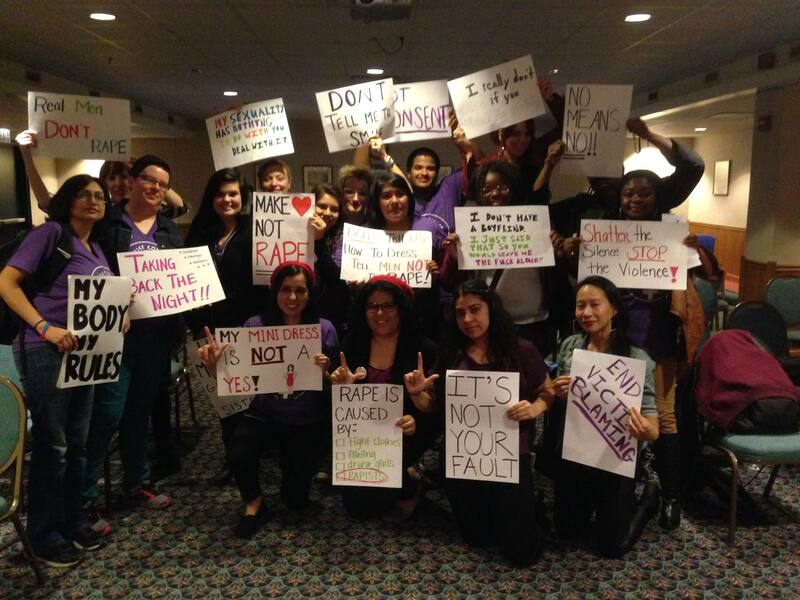 Members of Feminist Collective and event attendees gathered at “Take Back The Night” event at NEIU. As a transfer student, I am fortunate to be a member of a wonderful club here at NEIU: the Feminist Collective. I joined in the fall of 2013, my first semester at NEIU, and joining has connected me with like-minded students and faculty. The Feminist Collective offers time and space for students to come together and discuss current issues from feminist perspectives as well as plan and host event here on campus. Semester after semester, the Feminist Collective thinks about what we like and don’t like about the world around us, and how we can work toward meaningful change. How can we work for a world without inequality? Why is it so hard to imagine a world where gender doesn’t serve as a basis for discrimination and violence? What can we do to make the relationships we have with others and with ourselves healthier? Although we know there are no concrete answers to these questions, we host events that bring these questions into discussion. With a busy school/work schedule, it’s easy to get lost in article reading and paper writing. The Feminist Collective, the meetings, the events, and the people, are a weekly breath of fresh air. The Feminist Collective aims to bring fun, informative, feminist events to campus. Last year, the Feminist Collective hosted Take Back the Night where we hosted a safe and educational event for students to learn about the different ways that sexual violence affects people and how we can work towards a world free of sexual violence and free of fear. This year, we are hosting the event again! Our event is scheduled for Thursday, November 6 from 5-9pm in SU 003. Come to learn about the many ways that we can empower each other to resist violence in our lives. I am a senior with a major in Sociology and a minor in LGBTQ studies and I could not be happier with the education I have received at NEIU. Every class, every professor, every article, and every presentation has sharpened the way I think and transformed the way I participate in the world around me. I am applying to PhD programs for the fall of 2015 and I truly feel that my experiences here at NEIU have thoroughly prepared me for anything the future has in store. And before I go, what would this be without a plug for the Feminist Collective?! We meet on Tuesdays from 3:05-4:05 in LWH 2094. The Feminist Collective is a group of bright and insightful students who are always happy to welcome new members!